Soak badam in hot water for 30 minutes, peel the skin, and grind with milk to a smooth paste. Soak saffron in a tablespoon of warm milk. Grease a plate with ghee and keep ready. Pour this paste in a micro-proof bowl, add sugar and saffron. Cook this in microwave high for 15 minutes. Once in every two minutes, remove the bowl, mix well and microwave again. After 10 minutes, remove the bowl, add ghee and cook again. Now, once in a minute, remove the bowl , mix well and microwave again ( i.e., for 5 minutes, 5 times). 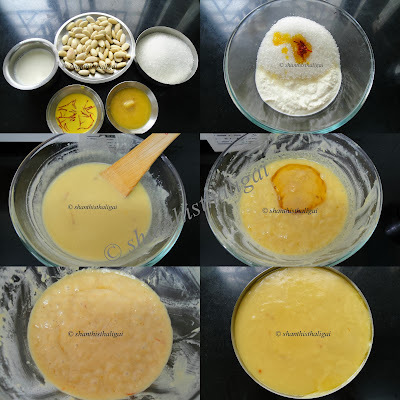 When the mixture becomes like a soft dough, pour the mixture on the greased plate and spread evenly. Cut to desired shapes while warm. NOTE: The time depends upon the heat of your MW oven from 13 minutes to 17 minutes. Looks delicious! Nice presentation too! Mouthwatering burfi and I love the microwave oven version of yours. Wow !! You have such a mouthwatering collection of deepavali recipes. Burfi looks really delicious.Love the idea of microwaving need not spend hours stirring it continuously. SUPERB ! MOUTH WATERING SWEET !! THANKS FOR SHARING !!! 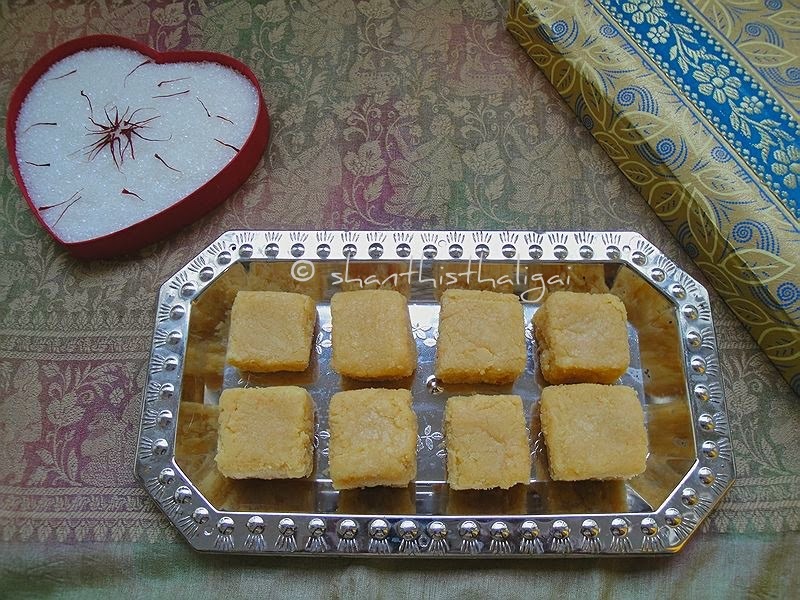 Delicious and lovely looking burfi. Perfect setting for the diwali festivals. wow MW burfi so perfectly its done..
Shanthi! Wow. it looks great.